Katniss Everdeen has been rescued from the Quarter Quell, and finds herself taken to the mysterious District 13. A rebellion against the Capital has begun, but Katniss finds herself distracted by the destruction of her home in District 12, as well as Peeta’s capture and possible torture. Once again, Katniss finds herself used as propaganda, this time by the rebels as their symbolic “Mockingjay.” But are District 13′s leaders any better than those in the Capital? Mockingjay is a much different story than The Hunger Games, or Catching Fire. While the first two books are more focused on the action in the titular Games, Mockingjay is much more introspective. 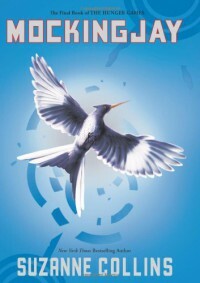 The book largely focuses on how Katniss copes with the death and destruction around her, which is done very believably. She’s obviously broken by her experiences, and fears she herself may be just as ruthless as the Capital. District 13 is a dystopia unto itself, an underground city where nearly everything is controlled. Citizens are stamped with daily schedules, and abuse of rations is considered criminal. While it is implied that President Coin, the leader of 13, is just as controlling as her Counterpart Snow, neither her character nor district seemed fully developed. The final epilogue feels a bit like an afterthought, serving mainly to provide closure to the Katniss-Peeta-Gale love triangle; although it takes place years later, the epilogue never really shows how things have truly changed as a result of the rebellion. Although it may not satisfy the expectations of all readers, Mockingjay is just as addictive as the first two novels in the series.